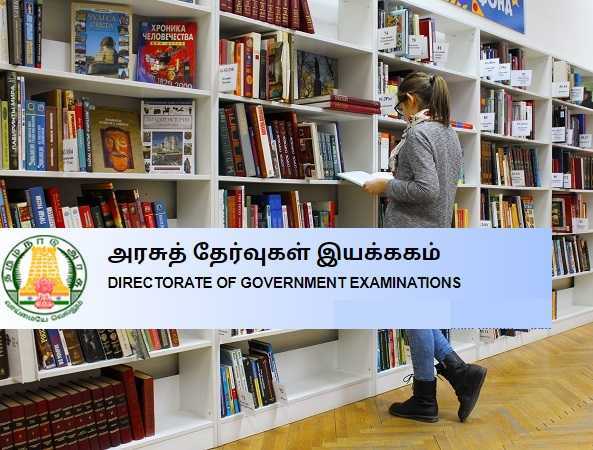 A list of X Std Final Examination (March-2019) has been put out on the official website of DGE, Tamil Nadu. 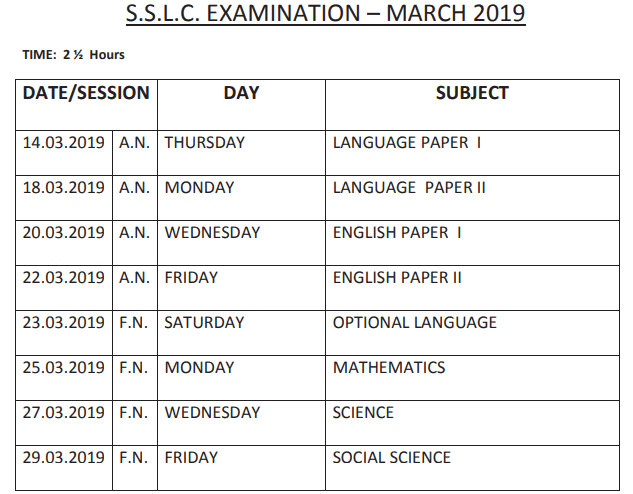 As per the time-table, the commencement of Secondary School Leaving Certificate (SSLC) Final Exams for 2018-2019 is expected from 16 March. Pupil candidates that are going to deal with Public / Private / Supplementary Class 10th Examinations will require TN SSLC Hall Ticket 2019 to collect from the School’s Headmaster while the direct private candidates will have to download it through the D.G.E’s Hall-Tickets web page. Along with the student’s identity, an admission certificate must show the Roll No, Name & Place of Examination Center, Subject-wise Timings, Paper Codes etc. on its front page. Meanwhile, A Nominal-Roll for the school candidates must have been prepared by the concerned school’s Headmaster. On the other hand, a private candidate has to register for the 10th Public Examinations through Govt. Exam Service Centers situated in every educational district. Annual Students, those have still not seen the date-sheet for March/April Theory Examinations can check the day wise, subject wise schedule of all papers in the forthcoming sections. Administration: Directorate of Government Examinations, T.N. TNDGE conducts SSLC (Xth) Public Examinations thrice in an Academic Year. Besides from March-April, the board is also managing Instant Special Supply Exams in June/July and other Supplementary Exams in Sept/Oct Sessions. The Special Supplementary is being conducted for the students who failed in the Mar/Apr sessions of the same year. And Those who have failed in one or more subjects in different sessions can apply and appear for Sept-Oct Exams. Regarding the passing marks, a candidate has to secure a minimum of 35% marks in each subject out of 100 marks, applicable for regular and supply or compartmental system too. The Roll No Slip (Hall Ticket) of all candidates General, Vocational, Private, Supply Holders etc. are being published on the authoritative portal of Tamil Nadu D.G.E Board. For the scholars, there should not be any problem in obtaining the hall tickets, as the respective school is liable to offer you one. However, Pvt. candidates will surely need to get this permission letter via the DGE’s site. While procuring the hall-ticket, one must have to provide the essential as well as some valid details like Registration No, Date of Birth etc. in the appropriate login fields. After the conduction of exams, Final Results of SSLC shall be shared in the month of May via Internet & News Papers. A candidate may apply for Re-totaling if he/she believes that this can increase their scores. Furthermore, the Award of a certificate, Mark sheet/Provisional Mark Certificate will be distributed by the authority according to the prepared schedule. Yes, Definitely you can check the complete exam scheme from there. Go & check it right now. All I have to give you is this tracking no “S18551680128” Can you pull it up Sslc examinations call letter with this. Si this for the Re-Exam, Right? Yes, the updates are given in the article.